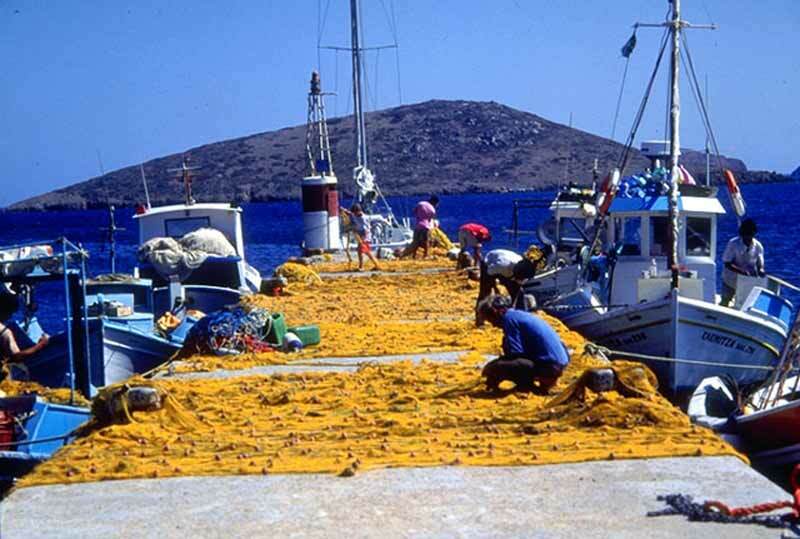 ASTYPALAIA - Nostalgia Travel Agency in Kos island, Dodecanese Greece. Difficult to get to, but worth the effort, this lovely “butterfly-shaped” island actually has a coastline longer that its mass, as the island is very narrow at its center, giving the appearance from afar as being two separate islands. Its size is only 97 Km², with 110 kilometers of coastline; its population is around 1.400, mostly living in the main town, or Chora, sitting high atop the hill and crowned by an imposing Venetian fortress. One surprise in store for visitors to this out-of-the-way destination is that Astypalaia (alternative spellings are Astipalea, Astipalaia, Astipalaea, Astypalaia or Astypalaea-all in use!) is actually part of the Dodecanese island chain, but to all appearances exactly resembles a Cycladic island, with whitewashed, flat-roofed small houses, colorful balconies, and winding streets and alleyways. Again, a strong Venetian influence is apparent here, and to add to the Cycladic scene is a row of windmills right in the town, a la Mykonos! 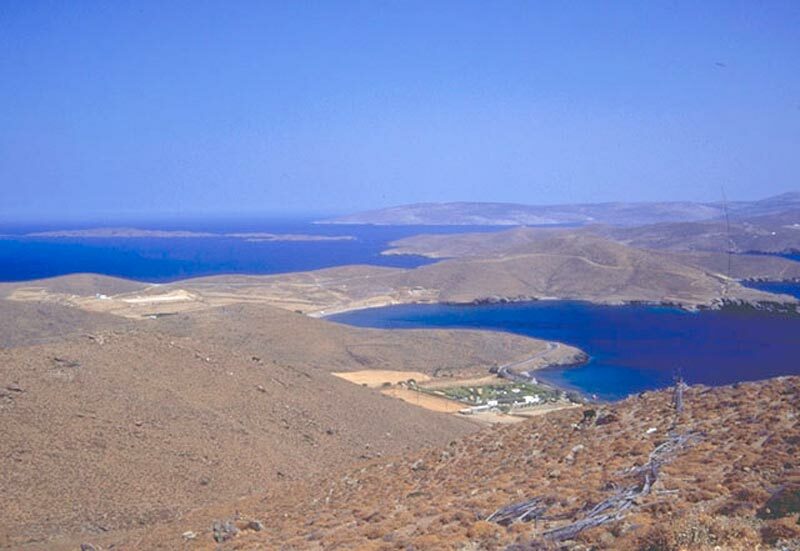 The terrain of the island is also quite similar to the Cyclades in that it is rather barren and brown, with small oases of greenery appearing here and there. While ferry service is not terribly frequent, there is a small regional airport with flights connecting to Athens, Rhodes, Kos, and Leros, several times a week. This is probably your best bet, as the ferry trip from Piraeus takes more than 12 hours, especially with frequent stops along the way. 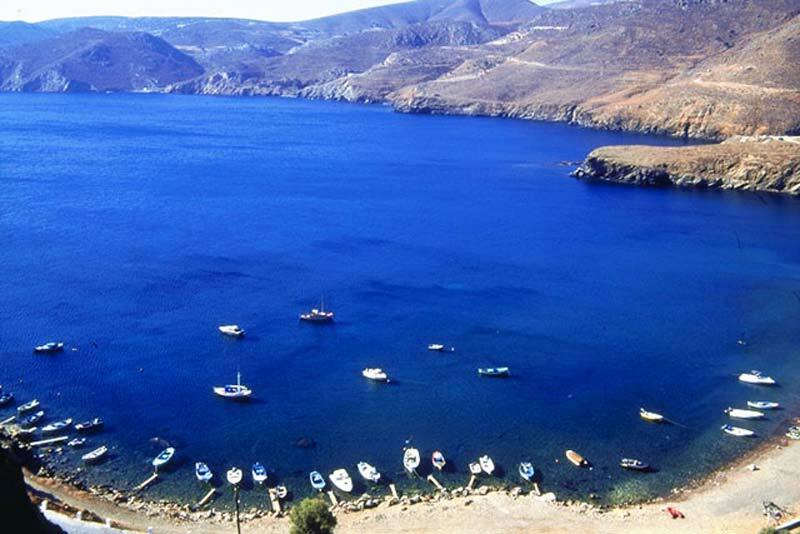 There is also limited ferry service connecting the Cyclades, about three times a week during high season. Astypalaia does get quite busy during the high summer season, so you need to book early for both accommodation and transportation to and from the island. Getting about the island is best done by motorbike, though there are some bus services between the main town and several more popular beaches. Astypalaia is a delight to explore, with lots of off-road tracks for your motorbike or for exploration on foot. Of course, one must explore the old fortress, which has two churches inside the site, including the oldest on the island, St. George. On the south side of the exterior walls of the fortress stands the lovely church of Our Lady Portaitissa, definitely worth a visit for its stunning bell tower and interior decoration. In one of the greenest parts of the island is Livadia, a small seaside village with a good sandy beach, and about 2 kilometers south of Chora. The island’s long coastline offers a variety of beaches, some good ones can also be accessed by caique. First inhabitants: the sources tell us that the first inhabitants were Carians (Ovid. Metamorphoses, 7, 49), Cretan subjects of the thalassocrator Minos or colonists from Megara (Skimnos of Chios, line 549), who called the island Pylaeon. - 436 BC: The island is under Athenian rule and plays a high annual tribute. - 431-404 BC: The Peloponnesian War. The island is colonised by former inhabitants of the city of Astypalaia on Kos, which the Spartans have laid waste. - 333 BC: In the time of Alexander the Great, the Greek cities are declared autonomous - Astipalaia makes an alliance with Alexander. - Roman era: The island is an ally of Rome and enjoys privileges. -105 AD: The treaty of alliance with Rome is renewed. 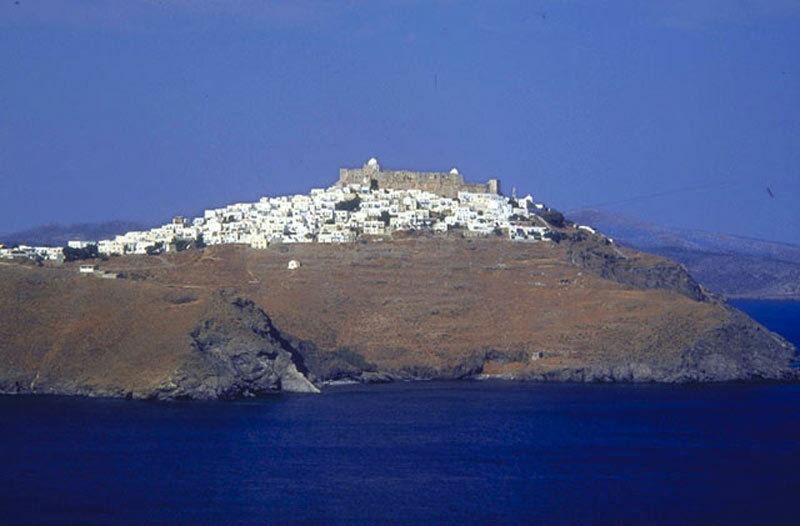 - 330 AD: Astypalaia becomes part of the Roman Empire. - 1207: The island passes into the hands of the Querini family. - 1269: Likarios, admiral of Byzantium, liberates Astypalaia.br> - 1333: John Querini siezes power once more. - 1341: Omer Marvasas, Emir of Maidini, captures the island and lays it waste. - 1537: The Ottoman admiral Barbarossa captures the island and occupies it for a short period. - 1821: Astypalaia takes part in the War of Greek Independence. - 1912: Italian occupation, lasting until the end of the Second World War. 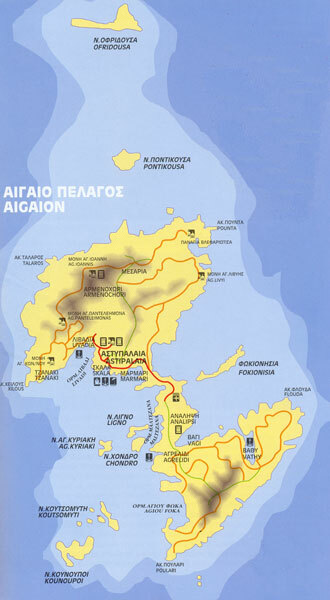 - 7 march 1948: Astypalaia and the other islands of the Dodecanese are united with Greece. Astypalaia, the westernmost of the Dodecanese group, is geographically and in terms of its architecture nearer to the Cyclades. It has an area of 96,85 km², a coastline of 110 km, and is 169 nautical miles from Piraeus, 94 from Rhodes, 57 from Kos and 44 from Kalymnos. Its terrain is for the most part mountainous, the highest peak being Vardia (48o m). The island seems to be divided into two parts, (north and south), but is in fact joined in the middle by a 100 meter isthmus, making it look like a butterfly or a bow-tie floating in the Aegean. 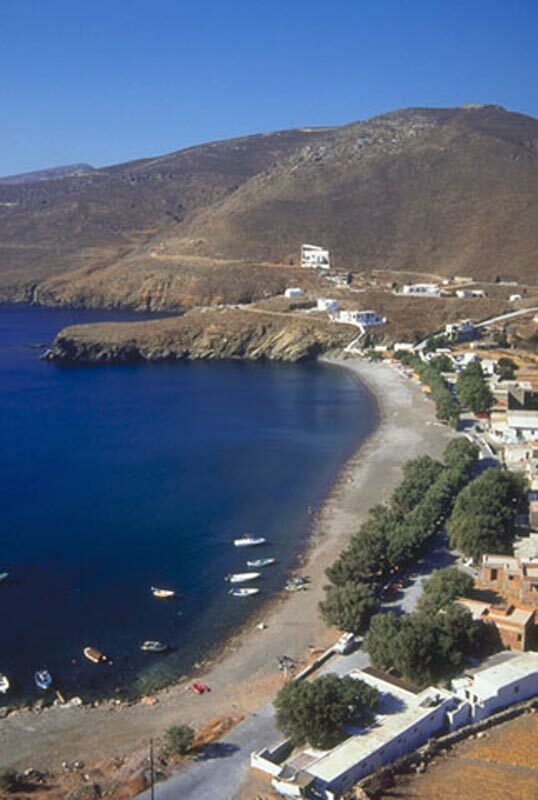 Its sheltered bays are ideal for swimming and fishing, and its capital, Chora, is very picturesque and attractive. The island's capital climbs up the mountain side below the imposing Venetian fortress. Its houses are a sprankling white and have painted wooden shutters and balconies in its narrow streets. The striking landscape is completed by the windmills, which form part of the mountain ridge. The castle which was built under Venetian rule when the Quirini were the local loerds, housed the inhabitants of the island during the Middle Ages, but was later gradually abandoned. Inside the castle, the entrance to which is on the south-western side, there are two important churches: St George, the older of the two, and the Annunciation. The view from the castle is enchanting. Immediately below the castle is the church of Our Lady Portaïtissa or of the Castle. 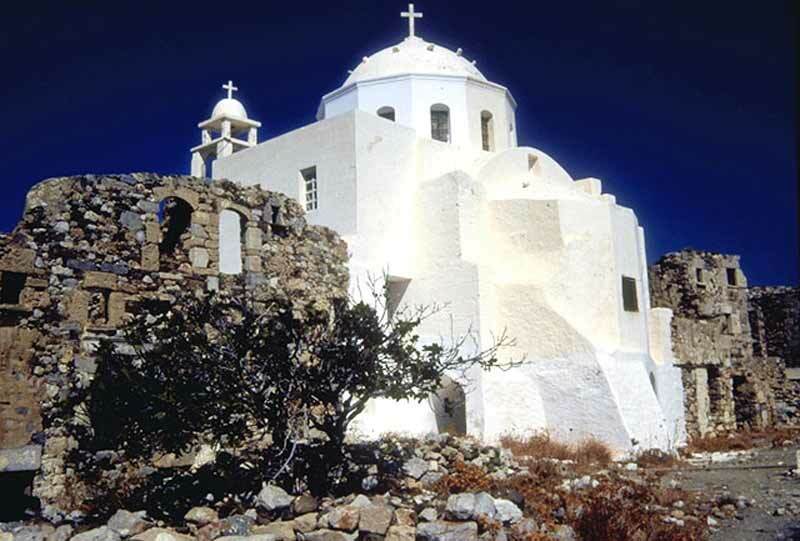 One of the most beautiful churches in the Dodecanese, it was built by St Anthimos the Blind in 1764, with the support and help of the old priest Michalis. The carved wooden sanctuary screen has a revetment of gold leaf and is regarded as one of the finest of its kind. The icon of the Blessed Virgin is a faitrhfull copy of the icon of the Portaïtissa at the Iveron Monastery on Mount Athos. It was brought from Athos by by the Saint himself. Its feast day is 15 August, which is the occasion of the island's most important fair. The archaeological museum's small collection is to be found in the municipal library. The island's port, below Chora. 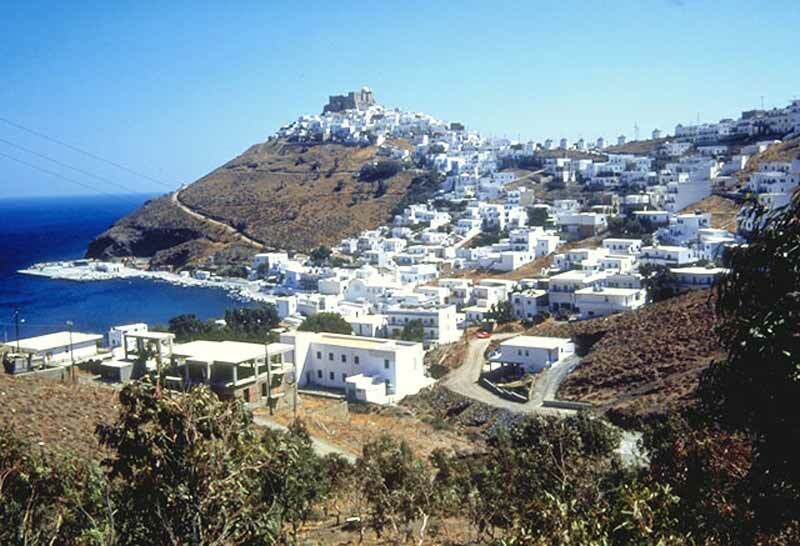 this is where the few hotels which Astypalaia boasts are to be found, together with tavernas. 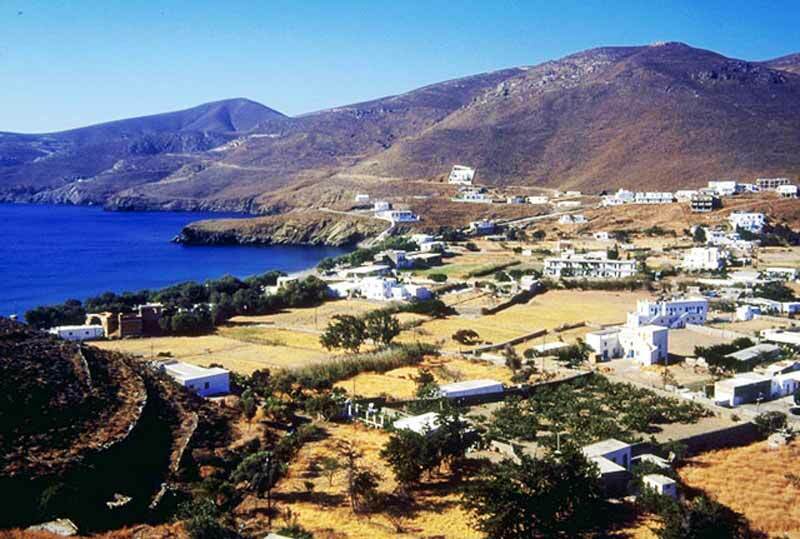 1,5 km south-west of Chora, the village stands in a verdant area with one of the island's finest sandy beaches, which, as a natural consequence, attracts large numbers of visitors. The road from Chora is good. A quiet beach in the same direction, unofficially a nudist beach. Approximately 4 km in the same direction, an attractive beach and a monastery are to be found. This can be reached either on foot or by caïque from Skala. The road which goes from Chora to the beaches mentioned above turns inland to the right and climbs, in an hour and a half, to the monastery. A fair is held here on 27 July, the feast of St Panteleimon. On a plateau after the Monastery of St Panteleimon. A branch off to the right on the road to Mesaria leads to this monastery, which is on an attractive site and has a guesthouse. From Mesaria the road continues to the west and leads to the monastery of St John (12 km from Chora), where there is an excellent beach and a ruined castle. It has its feast day on 29 August..
To the north-west of Chora, a road leads to this monastery, which stands on the side of the mountain above the sea and has a guesthouse. Three bays 2 km north-east of Skala, with a sand and pebble beach. 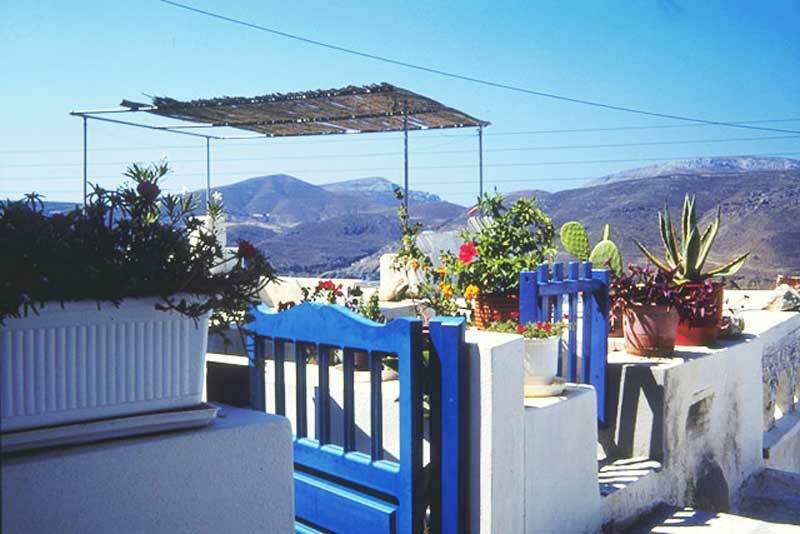 A picturesque village, 9 km from Skala, with white houses, flowers and orchards, a bathing beach and tavernas. There are well-preserved mosaics from a Roman swimming-bath and the memorial to a French philhelene admiral who in 1827 was killed when he set fire to the powder store of his corvette rather than fall into the hands of the pirates. The island's most remote and isolated fishing village. It consists of two parts, Exo and Mesa Vathy. Text from Davaris Publications. - Greek Islands: DODECANESE. © Nostalgia Travel  / Other Islands / Astypalaia.